October and early November are chestnut season in Tuscany. For centuries chestnuts were a dietary staple in the mountainous parts of Tuscany, such as the Garfagnana area above Lucca. Chestnuts were free, could be easily preserved by drying, and were valued for their high calorific content and versatility. During times of hardship or famine, such as the two World Wars, many people in these areas survived on chestnuts. Today, chestnuts have a revered status in the region (many varieties have been granted prestigious IGP (Protected Geographic Indication) status) and come autumn, are celebrated in castagnate (chestnut festivals). For the last couple of years, chestnut season has been a sad as well as celebratory time, as chestnut trees are under attack from the cinepide, or chestnut gall wasp (Dryocosmus Kuriphilus). Native to China, this wasp first arrived in Piemonte in 2002 and has since spread to other chestnut-producing reasons in Italy. It lays its eggs in the leaf buds of chestnut trees; these galls damage the new foliage, weaken the tree and result in a significant reduction (up to 70%) in the quantity of fruit produced. We have noticed the change ourselves, returning empty-handed from chestnut-foraging trips, but more seriously, this pest is destroying the livelihoods of chestnut farmers. Authorities are trying to combat this threat through biological pest control in the form of a parasitoid wasp (Torymus sinensis) which destroys the cinepide’s galls, but this needs time to take effect. In support of the region’s chestnut farmers we are selflessly munching our way through a wide range of local chestnut products, including biscuits, pasta, polenta and beer. A particular favourite of ours is miele di castagno (chestnut honey) an amber, slightly bitter honey which is delicious drizzled over pecorino Toscano cheese and eaten with walnuts or sliced pears. We have also been eating as many caldarroste (hot roasted chestnuts) as possible. These are traditionally enjoyed with the vino novello, the first wine of the year, so consumption will only increase in the next few weeks. Equally delicious are necci: thick chestnut flour pancakes typically served at Tuscan chestnut feste. Necci are cooked between hot stones or iron griddle plates and served with ricotta cheese and/or nutella. 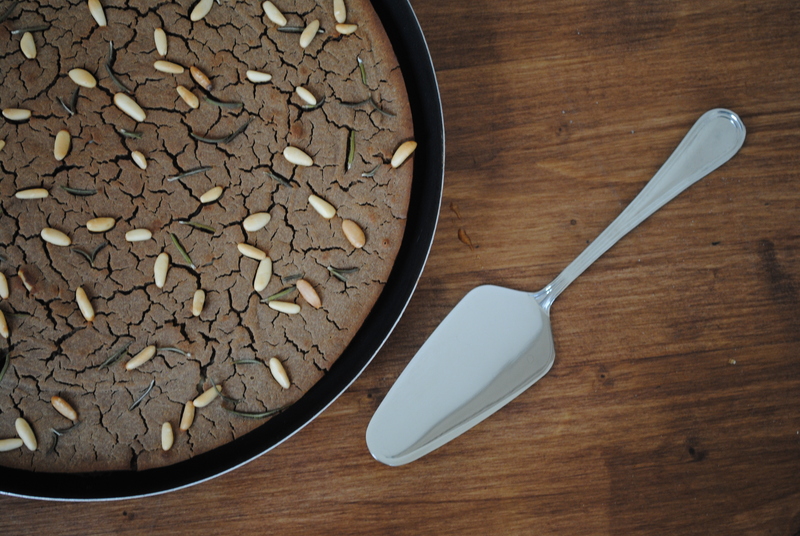 Also popular at castagnate is castagnaccio, a chestnut flour cake made with pinenuts, rosemary and (our favourite ingredient) extra virgin olive oil. Castagnaccio is a somewhat of an acquired taste: slightly bitter, with a dense, puddingy texture. Dark and flat, with a surface cracked like parched earth, it won’t win any beauty contests either. But once you get the taste for it, it’s addictive, and versatile. A dollop of ricotta cheese brings out its savory side, while a drizzle of chestnut honey or dusting of icing sugar takes off its bitter edge. We usually eat it as it comes, accompanied by a glass of Vin Santo or other sweet wine, on cold autumnal evenings. Add a pinch of salt to the chestnut flour. Gradually stir in two small glasses of water and a tablespoon of olive oil, until you have a smooth, thin batter (the same consistency as pancake batter). If using raisins, add half to the mixture at this stage. Oil a shallow cake tin (approx. 24cm in diameter) and pour in the mixture: it should be about 2 cm thick. Level the surface with a knife and sprinkle over the pinenuts and rosemary (plus orange zest and the remaining raisins, if desired). Drizzle a little more oil over the top. Bake for 35-40 minutes at 180 degrees Celsius /gas mark 4 until a crust has formed and a skewer or fork inserted comes out clean. The surface should be firm and cracked; the inside should remain soft and moist. This cake is gluten free and vegan. 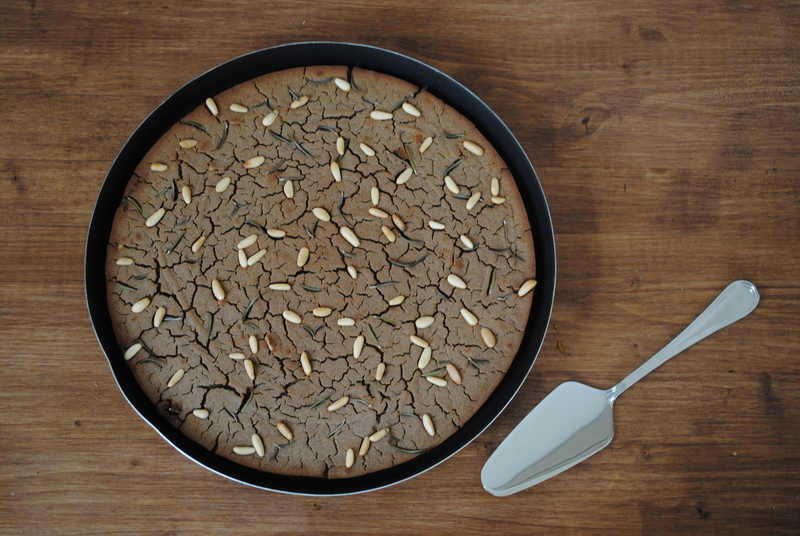 I have heard about the chestnut cake and thought of making it as I have a store of chestnut flour, but now that I read your recipe along with description of it and how to serve it, I am determined to do it. Thanks. This sounds wonderful! I love your selfless acts in support of the local farmers, how good of you! Can’t wait to visit Italy and support them myself. Looks interesting -always up for something new. My first thing is to find chestnut flour:) Please add to the 180 degrees: Celcius (otherwise non-Europeans may be puzzled) thanks for the recipe! I always forget about the imperial/metric thing – thanks. Bookmarked – this sounds amazingly refreshing and great for the season! I love chestnut a lot! I hope the chestnuts will be rescued from the attack of cinepide this is very sad. Greta Blog ! we should meet up we have a villa north of you near Castelnuovo di Garfagnana ! Mmm, looks lovely. The shops in Rome are full of chestnuts at the moment so I hadn’t realised there was a problem. Will eat as many as I can while I still can! Lots of the chestnuts on sale here in Tuscany now aren’t actually Italian, if you check the labels many are imported. But yes, it’s an excuse to eat as many as you can now. Had a look in the supermarket this morning and you’re right – lots of the chestnuts were from France. I made sure I bought some Lazio ones! Oh I adore chestnuts! Chestnut honey can be hard to find here (and expensive! But I love using it with pork etc.) but I love seeing various chestnut recipes. This looks divine. Chestnut honey is yummy as a glaze for meat, I agree. Or even eaten straight from the jar… Mmm! I’ve heard of a chestnut cake but never how to prepare it. Thank you for sharing your delicious recipe. Thanks for visiting. I love seasonal foods like chestnuts that you associate with a particular time of year… the anticipation, the excitement of the first taste, then gorging yourself before it goes out of season again. All this looks delicious. I need to explore eating chestnuts more 🙂 Especially the chestnut honey on cheese! That looks divine! 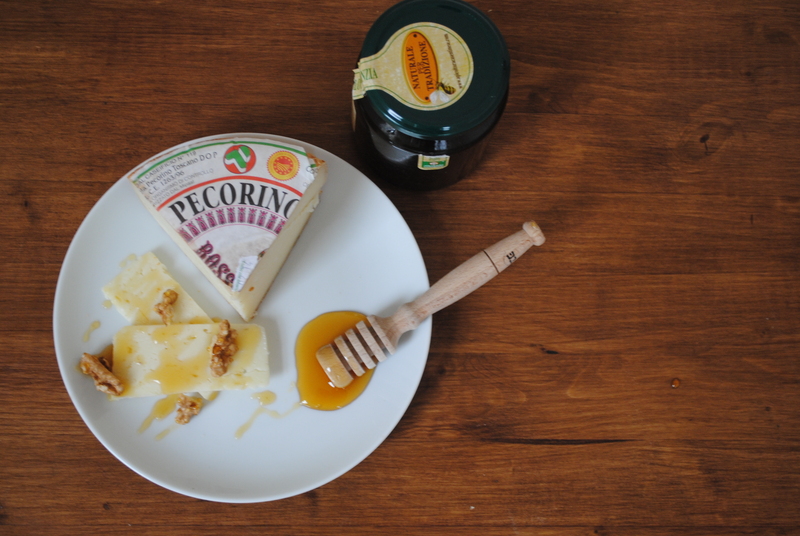 Any honey is good with pecorino (and other cheeses) but chestnut honey is my favourite, its bitter edge goes really well with the salty cheese. I also only knew of chestnuts during December. Thank you for sharing the great looking recipe and ideas. I had no clue about the pasta, honey and other foods made with it. You’ve really expanded my view of chestnuts! Yum Yum! This cake sounds great! Hi there 🙂 Happy to see you again on my blog!! How have you been? !